With the theme ‘Know your HIV status’, the World AIDS Day was observed in Imphal under the aegis of Manipur State AIDS Control Society at 1st Battalion Manipur Rifles ground in Imphal on Saturday. State Governor Dr Najma Heptulla, Chief Minister N Biren Singh and Health and Family Welfare Minister L Jayantakumar Singh attended as the chief guest, functional president and guest of honour respectively. Speaking on the occasion, Governor Dr Heptulla said that it is imperative to make modifications and improvements in the State AIDS Policy statement so as to suit the changing circumstances and trend. Observing that the HIV/AIDS issue is no longer a mere health issue, the Governor said that it has covered all aspects of life – social, economic, legal, human rights and even political. The Governor opined that HIV testing is a must for expanding treatment and ensuring that all people living with HIV can live a healthy and productive life. 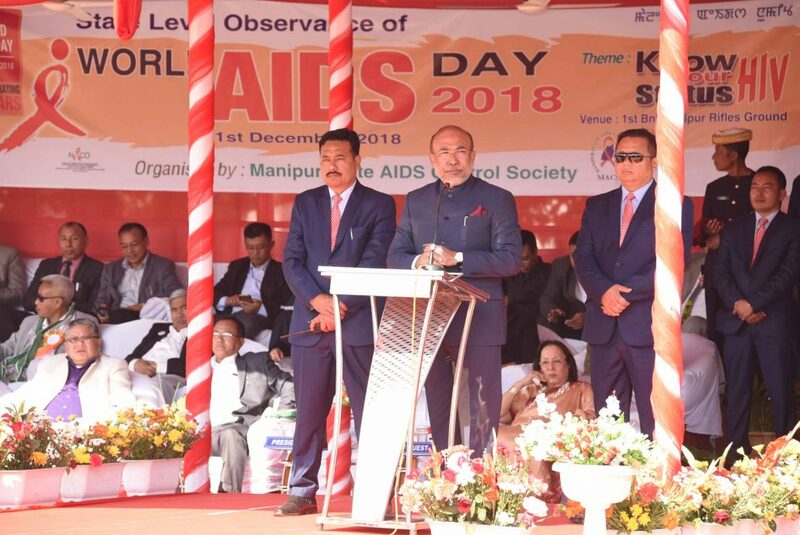 On the other hand, State Chief Minister Biren Singh said that though the HIV/AIDS prevalence rate is declining in the State, there is still need for a collective hard work of public, NGOs and the Government to achieve the target of having no new HIV infection in Manipur by 2024. As per the records provided by the State Health Department, the HIV/AIDS prevalence rate in the State is 1.43 per cent against the all-India rate of .022 per cent, he added. It is a matter of concern that 36 per cent of the population of the State is still under Below Poverty Line (BPL) though the per-head fund provided by the Centre to the State is three times higher as compared with the bigger states, the Chief Minister said. Biren Singh said that if any well-to-do or Government employee is wrongfully enjoying benefit under a Government scheme, it can be well assumed that he/she has snatched away the right or benefit from a deserved poor person. Health minister L Jayantakumar also spoke on the occasion which was attended by Revenue Minister Karam Shyam, Forest and Environment Minister Th Shyamkumar, Tribal Affairs and Hills Minister N Kayisii, Manipur Legislative Assembly Deputy Speaker K Robindro, MLAs, Chief Secretary Dr J Suresh Babu, Principal Secretary (Health) Vumlunmang Vualnam and other high ranking officials of the State Government. Later prizes of written quiz and on-the-spot painting competitions were distributed besides feting the best performing NGOs and District AIDS Control Officers with certificates and prizes.